Most of the world takes it for granted that central banks are necessary for the smooth conduct of trade, both foreign and domestic. Nothing could be further from the truth. Let’s be clear. Central banks are unnecessary barriers to commerce, harmful to economies, and enablers of war. A world of permanent peace and prosperity is impossible as long as they exist. Through their power to control banking, central banks are unnecessary barriers to commerce. Even those who have spent their entire lives in banking, often in positions of great importance and responsibility, assume that cooperative exchange of goods and services requires a central bank’s oversight. But consider a typical trade, whether foreign or domestic. Joe Smith in the US produces widgets. Of course he desires to produce and sell as many as he can at a profit. He has willing buyers in both the US and overseas. Because he manufactures and ships his widgets from the US he is required by legal tender laws to conduct his trade in US dollars. In fact were he to refuse to accept US dollars, by law the buyer could take delivery of Joe Smith’s widgets and not pay him at all. But Joe is concerned that the US dollar is being systematically debased by the Federal Reserve Bank and that the dollars he accepts from his sales will depreciate in purchasing power before he can re-employ them to pay for the factors of production to produce more widgets. Therefore, Joe must increase his price to compensate for this currency risk. But all this changes if the central bank and legal tender laws are eliminated. Joe can accept any form of payment to which he and his buyer agree. Since they both desire to trade, they will use whatever money is the most marketable; i.e., that money that others also will accept willingly. Gradually, sound money will emerge. It may be gold, silver, or something else, but it probably will be a commodity, a certificate (bank note), or account balance that is fully backed by a commodity (one hundred percent reserved). The commodity itself may be used in hand-to-hand exchange for small, local transactions, but probably most exchange would be conducted no differently than today where electronic tools debit and credit bank accounts. A government controlled central bank is NOT required to settle this transaction. Any honest, private bank could do it and would do it. 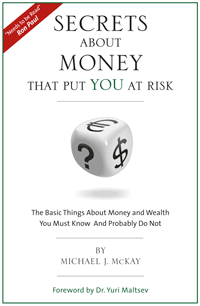 Nothing more is required than a book entry that increases the gold balance at Joe’s bank and decreases the gold balance at his customer’s bank, whether foreign or domestic. If Joe and his customer do not use the same bank, a third bank may be involved to settle the transaction. Such a bank is called a “correspondent bank”, meaning that both Joe’s and his customer’s banks have gold accounts there for the purpose of settlement. Many private banks perform this service today, bypassing the Fed. All three banks–Joe’s bank, his customer’s bank, and the private intermediate bank–would be subject to normal commercial law that prohibits fraud. Joe expects that his bank and his customer’s bank have enough gold either in their own vaults or probably held in their names at a private, correspondent bank to satisfy their purchases and receipts. Regular audits by reputable audit firms would ensure against fraud. These firms would verify that each bank has enough gold on deposit to back their demand deposits one hundred percent. Now, please tell me…where does government come into this transaction except to provide an honest court system in case of fraud or the occasional contract dispute? All trade is conducted by people. The statistics that aggregate a nation’s companies’ foreign purchases and sales are irrelevant and serve only to perpetuate the fiction that countries trade and not people. This leads to the completely fallacious claim that a nation whose companies and people sell more abroad somehow “wins” or benefits from trade and, likewise, that the nation “loses” if its companies and people in the aggregate buy more abroad than they sell. This fiction survives only because each nation has a central bank to control foreign exchange and legal tender laws that require its captive populace to use its ever depreciating currency. But if Joe Smith sells widgets to Honda Motors in Japan, each party benefits or the trade would not have occurred. Honda Motors’ bank account diminishes by the amount of the purchase and Joe Smith’s bank account increases. The reverse would be true if Joe Smith bought raw materials from a Mexican company. If each party benefits as expected from the trade, wealth is increased for the parties involved in the trade. Where in this transaction is the rationale for government control via a central bank and legal tender laws? Well, we all know the answer–government itself benefits by using the central bank to divert wealth to itself for wars and welfare. The irrefutable observation that people trade and not nations leads to the epiphany that political borders and politically based trade statistics are irrelevant, meaningless, not necessary, and ultimately harmful. So-called “trade deficit” statistics lead to calls for monetary debasement to spur foreign trade and even protectionist policies to reduce purchases from people and companies in foreign lands. But such trade is no different than buying produce from a local farmer. You and your local farmer both benefit, just as Joe and his Mexican supplier of raw materials benefit. The world is made more prosperous. The truly tragic consequence of keeping national trade statistics is that such irrelevant yet seemingly important data can lead to international tensions. Today we witness our political leaders branding individual nations to be predatory because their people and companies sell more goods to Americans than Americans buy in return. But where is the predation if one ignores national borders? Buying raw materials from Mexico is no different than buying produce from a local farmer. As an informative thought experiment consider what would change if Hawaii were not the nation’s fiftieth state and had remained a sovereign nation. Would the impact on the US trade balance of the other forty-nine states composing a slightly reduced US have any meaning from the fact that the US purchased pineapples from Hawaiian farmers who now would be branded as foreigners? Of course not! The same is true if Alaska had remained part of Russia and had not been sold to the US during our Civil War. Would our industries be worse off due to the fact that the oil from Alaska was produced by Russian citizens and not American citizens? Of course not! The oil is the same economic benefit, regardless of who produces it. Think this is unimportant? Consider that there is the potential for military conflict in the very far north over future oil exploration. Russians, Canadians, Norwegians and most ominously Americans all claim sovereignty over these heretofore untapped oil reserves and vow to keep out companies headquartered in foreign lands. This is reminiscent of the imperial wars that racked the European powers for centuries as each tried to monopolize world trade. World War II was caused in large part by the Japanese attempt to control all trade in Asia at the expense of the old colonial powers. Since 1945 the Japanese economy has benefited immensely from simple trade without the need to control its trading partners politically. This should be a lesson to today’s world leaders, but don’t hold your breath. A world of peace and increasing prosperity depends upon strictly limiting the ability of governments to interfere in international trade through their central banks and legal tender laws. Eliminating both would expose many economic fallacies that purport to characterize international trade as a competition between nations with their own citizens either winners or losers depending upon whether they are net exporters (winners) or net importers (losers). Central banks not only are barriers to trade and prosperity, they are fomenters of international tension and even war. Time to scrap them. Remember, the US did not have a central bank between the Age of Jackson–after President Andrew Jackson was successful in preventing the renewal of the charter of the Second Bank of the United States in 1837–and just prior to the Great War in 1913 when the Federal Reserve System was founded. During this era, despite fighting a civil war, the US economy grew probably at the greatest rate of any economy in the history of the world.